My words will be recorded there. with a pencil of white light. It is born from there. My words will reach there. I am not speaking to a vacuum. I have my light turned on. I have my breast open. I have my heart pure. It springs forth from there. I have my kindly pencil. It is in between my hands. It is in between my fists. They will arrive at a clean house. They will arrive at a white house. They will arrive at a celestial house. They will arrive at a house of flowers. Because I am begging for clemency. Because I am begging for justice. Now I hand it over. How far does the infinite light reach. How far does the white light reach. Because I ask with just words. Because my speech is sacred. In the house of chastity. Where the lovely table is set. They will arrive like fresh medicine. Thus I deliver this judgment. A poetic invocation from Japan. A poetic invocation from Russia. This poem uses the evocative phrase, "the mother table;" Liza Bakewell's essay explores the meanings of the Spanish word for "mother" in Mexican culture. This poem was originally written in Mazateco, the language spoken by some of the indigenous people in Oaxaca, Mexico. The rhythms in the poem are similar to the rhythms in traditional Mazateco chanting; the translators echo these rhythms in English. First published in English in the October 2005 issue of Words without Borders: Jaguar Tongues. Originally published in Que Siga Lloviendo, Escritores en Lenguas Indigenas, Mexico, 1999. Listen to Juan Gregorio Regino reading "Nothing Remains Empty" in Mazateco and Spanish. Read "The Poet Speaks, the Mountain Sings (A Talk & a Poem)," also by Juan Gregorio Regino. Watch a video of traditional Mazateco chanting. For images of daily life, look at the photo essay "Hoop Dreams in Oaxaca's Hills." Read the translators' essay, "The Indigenous Literature of the Americas." This essay was the introduction to Jaguar Tongues, the issue where this translation first appeared. Read about the traditional home of the Mazatec people in Oaxaca: A Land of Diversity. Look at a Google map of Oaxaca, Mexico, and a map of indigenous peoples in Oaxaca—Mazatec regions are pale blue. Read an interview with Dona Julia Julieta Casimiro, a member of the “indigenous grandmothers” council and a representative of the Mazatec culture. For a very different perspective on the power of words, read "Noisy Animal," by Japanese poet Sayaka Ohsaki, published in the magazine Words without Borders. Read more poetry by Juan Gregorio Regino, published in Words without Borders. Learn about the Mazateco language and find online lessons. Find additional translations and other work from Earl Shorris and Sylvia Sasson Shorris. 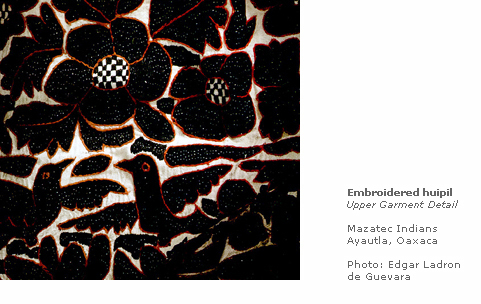 Look at an embroidered huipil, a traditional Mazateco women's garment, from an exhibit of Mexican textiles curated by anthropologist Jill Vexler. Large black-petaled flowers, with checkered centers, and birds with wings spread, all outlined in red. Learn about indigenous dress and dance in Oaxaca. For classical examples of invocations, take a look at the beginning of Homer's The Iliad and The Odyssey, or Dante's Divine Comedy. Read the book Words of the True Peoples, an anthology of contemporary indigenous Mexican literature.